Home > PHOTOS > How To Calculate Number Of Blocks For Your Building Project In 2 Simple Steps. What is the number of blocks required to complete this building?This is a common question asked by prospective home owners especially after the building design phase.It is advised you use trusted professionals for your building project. This saves you time and money. However, if you are taking charge of material procurement or just wish to confirm number of blocks required for your project, these 2 simple steps outline the process outlines the steps you need to take. A simple 1 bedroom apartment is used in this case for clarity. These are the two basic steps: Step 1: Calculate wall areas. Step 2: Divide total wall area by area of one block. 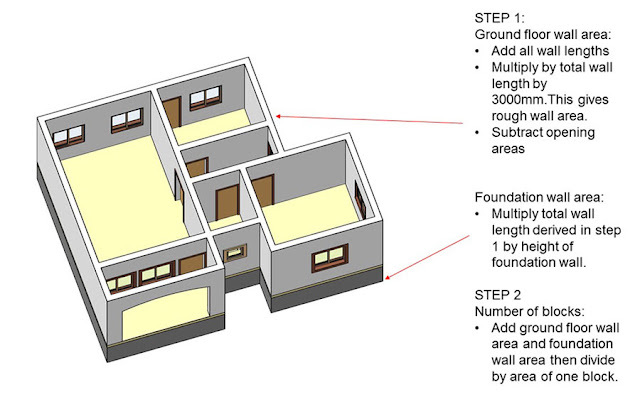 To calculate wall areas, we will calculate the total length of walls and multiply by wall height(see plan image below). Sum of all wall length is=59,105mm. Use height of wall at 3000mm. Also,remember we have a foundation. The foundation area depends on the number of courses laid. For this building, we use four courses of block wall as foundation (Strip foundation). This is roughly 900mm high. We simply multiply the perimeter of walls we got in step 1 by the height of the foundation wall. Area is still length x height. But now the height is 900mm. That’s approximately1,980 blocks. You may want to add a certain percentage for breakages and off-cuts. If you use good quality vibrated blocks you only need to add a little. Wish you success on your building project.Thank You!